Ordinarily, established reef aquaria do not have issues with ammonia because their large amounts of bacteria and algae serve to rapidly eliminate it from the water. However, new aquaria, hospital tanks, quarantine tanks, shipping bags and reef aquaria containing something that has died can have ammonia levels that rapidly rise to toxic levels. In fact, I believe that, along with low oxygen, ammonia can be the primary immediate cause of many tank crashes. Something dies, it decays and releases ammonia, the ammonia kills something else, and the system spirals out of control, with ammonia being the main factor. This article provides a detailed basis for understanding ammonia in seawater - where it comes from, how it is toxic and at what concentrations, and how to deal with ammonia "emergencies." It is beyond the scope of this article to provide size and other guidance regarding filters designed to facilitate the nitrogen cycle, and it deals primarily with reef aquaria where no such filters are used, or at least where they are not the focus of any concerns. Water always contains protons, and the lower the water's pH, the more protons it has. In fact, a drop of one pH unit means exactly a tenfold increase in the number of protons. So at lower pH, where there is a large amount of H+, the equilibrium is shifted away from ammonia and toward ammonium. This shift is actually very important in understanding its toxicity, as NH3 and NH4+ may have different rates of passage across fishes' gills. This exchange between ammonia and ammonium is incredibly fast. It can happen in a billionth of a second, and for a single ammonia molecule, the conversion can happen a billion times a second.1 So on a human time scale it is often inappropriate to think of them as different species, but rather it is more appropriate to think of any individual ammonia molecule as spending a portion of its time as free ammonia, and a portion of its time as ammonium ion, with those relative time portions being a function of pH. The pKa of ammonium in seawater is about 9.3 (some references state 9.5, with the difference possibly relating to the different pH scales sometimes used for seawater and freshwater).2 That pKa means that at pH 9.3 the water has equal concentrations of ammonium and ammonia. At pH values below this level, as is always the case in reef aquaria, ammonium predominates. Figure 1 shows a plot of the relative fractions of ammonia and ammonium as a function of pH in seawater. At pH 8.2 only about 7% of the ammonia is present as free ammonia, with 93% present as ammonium. Figure 1. The fraction of free ammonia (NH3) and ammonium ion (NH4+) present in seawater as a function of pH. Because many authors attribute ammonia's toxicity primarily to free ammonia (whether this is correct or not, see below), Figure 2 shows an expanded view of Figure 1 for the free ammonia concentration over the pH range of usual interest in reef aquaria. The amount of free ammonia present at pH 7.8 is about one-fourth the amount present at pH 8.5. Figure 2. The fraction of free ammonia (NH3) present in seawater as a function of pH over the range of most interest to reef aquarists. This figure reproduces Figure 1 on an expanded scale. 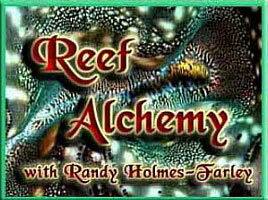 Reef aquarists also are often interested in pH values below those typically present in actual reef aquaria. A shipping bag containing fish, for example, often drops substantially in pH over the course of hours to days, as a result of expelled carbon dioxide. That change in pH can convert even more of the free ammonia to ammonium, and Figure 3 shows the fractions of ammonia and ammonium on a log scale, making it clear that the free ammonia continues to drop in concentration as the pH drops, even when it is already present as a very small fraction. Figure 3. The fraction of free ammonia (NH3) and ammonium ion (NH4+) present in seawater as a function of pH. This figure shows the fraction on a log scale over a wider pH range than Figure 1. A variety of different units have been used to report ammonia concentrations. The unit "ppm NH3-N" represents the parts per million of nitrogen in the sample's free ammonia. The unit "ppm NH4+-N" represents the parts per million of nitrogen in the sample's ammonium. The unit "ppm total NH4-N" is often used to represent the sum of nitrogen in both ammonia and ammonium in the sample. To convert ppm NH3 to ppm NH3-N, multiply by 0.82, because ammonia is 82% nitrogen by weight. To convert ppm NH4+ to ppm NH4+-N, multiply by 0.77, because ammonium is 77% nitrogen by weight. There can be no standard conversion between ppm total NH4-N and ppm total NH4 because the conversion would depend on the relative amounts of free ammonia and ammonium ion. One ppm in seawater is close to one mg/L (actually 1.03 mg/L), so for most purposes in the context of ammonia in seawater, mg/L and ppm are interchangeable units. Many chemical oceanography papers report concentrations in units of molar (M), mM or mM. One M NH3 is equivalent to one mole/L, or 17 grams per L, which equals 17,000 mg/L. One mM NH3 is equivalent to one millimole/L, or 17 milligrams per L. One M NH3 is equivalent to one micromole/L, or 17 micrograms per L, which equals 0.017 mg/L. There are a variety of sources of ammonia in reef aquaria. Minor sources include: 1) tap water (especially if it contains chloramine and is not treated with a deionizing resin) and 2) impurities in salt mixes and other additives. It has previously been shown that the total NH4-N ranged from 0.55 to 11.9 micromole/kg (0.008 to 0.17 ppm total NH4-N) in an analysis of eight brands of artificial seawater mixes. At the higher end of the scale, those levels will be detected with an ammonia test kit and can present potential toxicity concerns if fish are kept at those levels (see below). These levels of ammonia may be introduced from impurities in calcium chloride and magnesium chloride, where ammonia is a well known impurity resulting from some of the commercial manufacturing processes used (such as the Solvay process, which involves ammonia). Calcium and magnesium additives can also be a significant source of ammonia, especially for aquarists who are trying to use inexpensive sources of bulk calcium or magnesium chloride. I discussed testing calcium chloride for ammonia in a previous article. The predominant source of ammonia in marine aquaria is excretion by fish and other heterotrophs (organisms that live by consuming organic materials). Fish excrete large amounts of ammonia (and ammonium) from their gills, and possibly smaller amounts from their urine, which is why all aquaria must contain some mechanism to prevent the excreted ammonia from rising to toxic levels. Heterotrophic bacteria can also be a big source of ammonia in aquaria. For example, uneaten fish food that is broken down by bacterial action will usually result in ammonia being released to the water. Many other marine organisms that are likely to be found in reef aquaria also excrete ammonia, such as crabs and shrimp. In fact, most any organism in a reef aquarium that lives by consuming food (rather than by photosynthesizing) excretes some amount of ammonia. The mechanisms whereby marine fish excrete ammonia are different from those in freshwater fish, and aquarists must be careful not to extrapolate findings from freshwater fish to marine species without carefully considering whether it is reasonable to do so or not. Marine fish excrete ammonia via their gills in several ways. Like in freshwater fish, free ammonia can passively diffuse out of the cells that make up the gills, and this is often the dominant pathway for excretion. This result has large implications for ammonia's toxicity to fish. Because free ammonia is passively diffusing out of cells and into the surrounding seawater, it requires a downhill gradient to proceed. If the seawater's ammonia concentration rises, this excretory mechanism does not operate effectively. It might even operate in reverse. Because it is the free ammonia concentration in the surrounding fluid that determines the ability of free ammonia to be excreted in this fashion, pH plays a substantial role in determining elevated ammonia's ability to prevent this excretory mechanism from operating. Lower pH in the surrounding seawater converts more of the ammonia to ammonium, leaving less free ammonia to back up this excretory pathway, resulting in less observed toxicity. However, the popular scientific notion that the diffusion pathway involves simple diffusion of free ammonia through cell membranes seems no longer to be supported by recent studies utilizing modern biomolecular techniques. It is now recognized that this passive diffusion of NH3 more likely takes place through the spaces between cells, called paracellular tight junctions, and this transport phenomenon is called paracellular transport. These junctions, while usually tight enough to prevent large molecules from passing through, are leaky enough, in both marine and freshwater fish, to allow both water and ammonia to pass through. Without going into any more detail on how freshwater and marine species differ in their free ammonia excretion (there are other important differences), a very important difference is that the paracellular junctions in marine fish are leakier than in freshwater fish, and these junctions can allow marine fish to passively excrete a substantial amount of ammonium ion. Because this pathway also involves the passive diffusion of ammonium from the blood to the surrounding fluid, the conversion of ammonia to ammonium in the ambient environment at low pH cannot completely reduce the toxicity of ammonia/ammonium in the surrounding fluid, even though it can largely do so in freshwater fish. These issues will be discussed in more detail in the toxicity section, but it bears repeating that if assessing ammonia toxicity is the goal, do not ignore contributions from ammonium ion elevation in the marine environment. There are also other mechanisms whereby ammonia may be excreted from fish gills. These include an antiporter protein in the gill cell membranes that allows sodium to enter, and uses the chemical energy from that process to pump out ammonium ion. This process may not be used much at all during normal conditions, under which passive diffusion of ammonia and ammonium predominate, but may be very important when surrounding ammonia and ammonium levels rise excessively (> 1 ppm NH3-N), leaving it as the only viable mechanism for ammonia excretion. Since some fish have adapted to, and survive in, such environments (certain burrow-dwelling fish, for example), this mechanism can be critical to them. Many studies have examined ammonia's conversion to nitrite, and many articles have been written for professional and hobby aquarists that detail various practical aspects of the process, such as how to set up appropriate filters to facilitate this process. Stephen Spotte covers these in great detail in two of his books.6,7 Many reef aquaria have no filters set up specifically for this purpose, and the bacteria that carry out this process reside in coatings on most surfaces in the aquarium, including rocks, sand, glass, plastic and even on the surfaces of other organisms, such as coralline algae. An important thing to remember, however, is that most of these bacteria reside on surfaces, so we should think of the aquarium as having (or not having) sufficient bacteria to provide nitrification, rather than the water itself as having them. This distinction is important when moving one set of organisms into a new aquarium. Bringing old aquarium water in with them may help to start a culture of bacteria, but will not provide much initial nitrification capacity. Bringing in rocks and sand, however, and a little old water, may be very effective in instantly providing adequate nitrification capacity. The nitrification process is seldom as simple as many aquarists believe. It is not always a single species of bacteria carrying out the process, for example. In the ocean many species of bacteria can oxidize ammonia, including Nitrosospiras, Nitrosomonas and Nitrosococcus.8-10 When studied in freshwater aquariums (where more research has been performed than in marine systems), the bacteria are often represented by a variety of different species and strains, and are not always dominated by one type. In marine aquariums the species can include Nitrosomonas marina11 and Nitrosomonas europaea.12 While it is of little practical importance for most aquarists to know what species of bacteria process ammonia to nitrite, one situation where that may play a role is in assessing products that claim to accelerate the nitrogen cycle by adding (allegedly) live bacterial cultures. Along these lines, I've seen few, if any, studies on the suitability of any of the various commercial products intended for this purpose. It is certainly possible for live cultures to accelerate the buildup of appropriate levels of nitrifying bacteria to keep ammonia in check. Properly added cultures can almost immediately begin processing ammonia.11 The cultures chosen, however, must have been raised under temperature, nutrient and salinity conditions similar to those in the aquarium to which they are added for this to be optimally effective, and I do not know whether any commercial bacterial cultures sold to hobbyists meet this requirement. Many organisms take up ammonia directly for use in making the proteins and other biomolecules they need to build tissues. Algae, both micro and macro, for example, readily use ammonia from the water. In cases where they are exposed to both nitrate and ammonia as nitrogen sources, many preferentially take up ammonia.6 When using nitrate, many of the pertinent biochemical pathways require the organism to reduce nitrate to ammonia before using it, so taking up ammonia makes sense.6 It has not been established in a reef aquarium setting, however, what portion of the macroalgae's nitrogen uptake is ammonia and what fraction is nitrate. The amount of nitrogen taken up by a large macroalgal filter is substantial. A free PDF (portable document format) article in the journal Marine Biology13 has some useful information with respect to the potential export abilities of algae. It gives the phosphorus and nitrogen content for nine different species of macroalgae, including many that reefkeepers maintain. For example, Caulerpa racemosa collected off Hawaii contains about 0.08% by dry weight phosphorus and 5.6% nitrogen. Harvesting a pound (454 g; dry weight) of this macroalgae from a reef aquarium would be the equivalent of removing 25.4 grams of nitrogen, which, if it were all present in 100 gallons of water as ammonia, would be equivalent to a concentration of 67 ppm total NH4-N. Even if it took three months to grow to that mass, it would effectively be taking out the equivalent of 0.75 ppm total NH4-N per day. There are several ways to test for ammonia in seawater. These include test kits based on both salicylate and Nessler chemistry. One significant concern with the Nessler method is the toxicity and hazardous nature of the waste that is generated by its use (it contains mercury). Ammonia's reaction with hypochlorite forms monochloramine, which then reacts with salicylate in the presence of sodium nitro-ferricyanide to form 5-aminosalicylate. That complex is yellow to green to dark green based on the level of ammonia present. In some versions of the test, calcium and magnesium can cause interference, so be sure such a kit is designed for marine systems. The distinction between these methods can be important, as some combinations of ammonia binding products and test methods can lead to false ammonia test results (either causing apparent ammonia presence when it is bound, or simply causing a color that is not predicted by the test kit). For example, a Nessler type kit cannot read ammonia properly if the aquarist is using Amquel, Seachem Prime or related products to bind ammonia. The result is often an off-scale brown color. So, it is particularly important that aquarists understand how the test kit that they are using, and the binder that they are using interact, and the manufacturers of each are the best place to find such information. My suggestion is to always measure total ammonia. If a kit gives a choice of measuring free ammonia, don't bother. You can always use a table to convert total ammonia to free ammonia if there is a strong reason to do so. The reason to measure total ammonia is that the signal will be much larger, so the kit will be more capable of distinguishing a small reading of ammonia from no detectable ammonia. Ammonia is very toxic to marine fish. The mechanisms of toxicity are complicated and are an active area of continued investigation by researchers. Its effects include damage to the gills, resulting in poor gas exchange, ion regulation and blood pH regulation.14 Other effects include hampering oxygen delivery to tissues, disrupting metabolism and toxicity to the nervous system that causes hyperactivity, convulsions and death.14 Ammonia can also be very toxic to many other organisms found in reef aquaria. Toxicity can be measured and reported in many ways. One common way to measure acute toxicity is to measure how high the concentration needs to be in order to kill half of the organisms in a given time period. A commonly used time period is 96 hours (four days). Such data are called the 96 h LC50 (LC stands for Lethal Concentration, 50 meaning 50% killed). The other complication that comes with ammonia's toxicity is the relative amount of free ammonia and ammonium ion. While ammonium ion may be toxic to marine fish, it is probably less toxic than free ammonia, and toxicity data are often reported only for the concentration of free ammonia. Aquarists should recognize, however, that such data may not be appropriate if the pH used in the test, or the situation to which it will be applied, deviates significantly from normal seawater's pH (as in a shipping bag, for example, whose pH may be well below pH 8.2, and whose toxicity may actually be coming from ammonium, and not the low concentration of free ammonia). Nevertheless, many scientific articles report ammonia toxicity in ppm (or mg/L) NH3-N. It may also be reported as just ppm NH3. Marine fish14 generally have 96 h LC50 levels that range from about 0.09 to 3.35 ppm NH3-N. That result is not particularly different from the range observed for freshwater fish,14 0.068 to 2.0 ppm NH3-N. Remember that these values are ppm NH3-N, and at pH 8.2, the marine range becomes 1.3 to 50 ppm total NH4-N because only 7% of the total ammonia in seawater is present as free ammonia. Concentrations of ammonia that are not acutely lethal can still cause significant problems for fish. Salmon in seawater at pH 7.8, for example, show changes in white blood cells and various blood chemicals, and were more prone to disease, when exposed to sublethal concentrations of ammonia.15 Consequently, aquarists should strive to keep ammonia concentrations well below lethal levels. Because ammonia's toxic effects appear at levels significantly below those that are acutely lethal (0.09 to 3.35 ppm NH3-N or 1.3 to 50 ppm total NH4-N at pH 8.2), and because some organisms in a reef aquarium may be more sensitive than the few organisms that have been carefully studied, it is prudent to err on the side of caution when deciding what concentrations of ammonia to allow in a reef aquarium or related system. My suggestion is to take some sort of corrective action if the total ammonia rises above 0.1 ppm. This suggestion is also made by Stephen Spotte in his authoritative text, Captive Seawater Fishes.6 Values in excess of 0.25 ppm total ammonia may require immediate treatment, preferably involving removal of all delicate (ammonia sensitive) organisms from the water containing the ammonia. Some of the possible actions to take are detailed in the following sections listed below. Various types of compounds are used in commercial products to bind ammonia in marine aquaria. One is hydroxymethanesulfonate (HOCH2SO3-). It is a known ammonia binder16 patented for aquarium use by John F. Kuhns17 and sold as Amquel by Kordon and ClorAm-X by Reed Mariculture, among others. What ultimately happens to the aminomethanesulfonate in a marine or reef aquarium is not well established, but it does appear to be significantly less toxic than ammonia, and more than likely it is processed by bacteria into other compounds. Marineland Bio-Safe claims to contain sodium hydroxymethanesulfinic acid (HOCH2SO2-). I do not know if that is a typographical error, or if Marineland really uses this slightly different compound. Note: products containing hydroxymethanesulfonate hamper the ability to test for ammonia when using certain types of test kits (see above). Presumably, the H2NCH2SO3- formed is still reactive with the Nessler reagents, even though it is not ammonia. A second type of compound used in commercial products (such as Seachem Prime) that claim to bind ammonia in marine aquaria is said to contain hydrosulfite (could be either HSO2- or - O2S-SO2-) and bisulfite (HSO3-). These compounds are well known dechlorinating agents, reducing Cl2 to chloride (Cl-), which process is also claimed to occur in these products. It is not apparent to me whether these ingredients actually react with ammonia in some fashion, or whether unstated ingredients in these products perform that function. Seachem chooses to keep the ingredients of their product secret, so aquarists cannot determine for themselves what is taking place, and how suitable it might be. Nevertheless, many aquarists seem to have successfully used products such as these to reduce ammonia's toxicity. Note: products such as Seachem Prime hamper the ability to test for ammonia when using certain types of test kits (see above). Presumably, the product formed is still reactive with the Nessler reagents, even though it is not ammonia. Few filter media are capable of binding ammonia from seawater. The zeolite clinoptilolite (a sodium aluminosilicate) is capable of binding ammonia from freshwater, but the sodium ions in seawater displace much of the ammonia. In fact, the ammonia binding capacity of clinoptilolite in freshwater can be regenerated by rinsing it with salty water. Consequently, its capacity to bind ammonia in seawater is very low, if any, so it is not a very useful product for marine systems. Water changes can be a fine way to reduce toxic ammonia levels, especially in a small system such as a quarantine or hospital tank. The effective use of this method, however, demands that the new salt water does not contain significant ammonia. Because many types of artificial seawater do contain ammonia (see above), this method must be used with caution. As a rule of thumb, ammonia will usually drop by about the same fraction of water that is changed, so a 30% water change will reduce ammonia by 30%. However, if there is a source of ammonia in the aquarium, it may rapidly rise again. A 30% drop may not be noticed with many test kits. For example, it may be difficult to distinguish 1.2 ppm from 0.84 ppm total NH4-N using many kits, so do not panic if the ammonia level does not appear to drop, but also be realistic about how much you would expect it to drop from a water change on the order of 10-30%. In an ammonia "emergency" much larger water changes may be appropriate. Further information on water changes is detailed here. Ammonia is very toxic to marine fish and other organisms in a reef aquarium. While routine ammonia measurement is not ordinarily required in established reef aquaria, it can be very important when fish are in temporary quarters, such as shipping bags, hospital tanks and quarantine tanks. Most aquarists associate ammonia with new aquarium "cycling," and in that situation it is critically important to wait for ammonia to decrease to very low levels before adding organisms (much more important than waiting for nitrite to decrease, for example). Ammonia can also be very important during tank crashes. In all of these situations, I recommend striving to keep ammonia below 0.1 ppm total NH4-N. If the level rises above 0.25 ppm total NH4-N, I suggest taking immediate action, such as using an ammonia binder or performing water changes. 1. Proton exchange between ammonium ion, trimethyl-ammonium ion, and water. Speed of the dehydration step that precedes bimolecular proton transfer. Grunwald, Ernest; Ku, Alice Y. Brandeis Univ., Waltham, MA, USA. Journal of the American Chemical Society (1968), 90(1), 29-31. 2. A chemical model of seawater including dissolved ammonia and the stoichiometric dissociation constant of ammonia in estuarine water and seawater from -2 to 40° C. Clegg, Simon L.; Whitfield, Michael. Sch. Environ. Sci., Univ. East Anglia, Norwich, UK. Geochimica et Cosmochimica Acta (1995), 59(12), 2403-21. 3. Measurement of Diffusive Flux of Ammonia from Water. Zhang, Genfa; Uehara, Tomoe; Dasgupta, Purnendu K.; Clarke, Antony D.; Winiwarter, Wilfried. Department of Chemistry and Biochemistry, Texas Tech University, Lubbock, TX, USA. Analytical Chemistry (1998), 70(17), 3656-3666. 4. Ammonia excretion and urea handling by fish gills: present understanding and future research challenges. Wilkie, Michael Patrick. Division of Life Sciences, University of Toronto at Scarborough, Scarborough, ON, Can. Journal of Experimental Zoology (2002), 293(3), 284-301. 5. Chemical Oceanography, Second Edition. Millero, Frank J.; Editor. USA. (1996), 496 pp. 6. Captive seawater fishes: Science and technology. Spotte, Stephen; John Wiley & Sons, New York, 1992 ISBN 0-471-54554-6. 7. Seawater Aquariums: The Captive Environment. Spotte, Stephen; John Wiley & Sons, NY 1972 ISBN 0471056650. 8. 16S rRNA and amoA-based phylogeny of 12 novel betaproteobacterial ammonia-oxidizing isolates: extension of the dataset and proposal of a new lineage within the nitrosomonads. Purkhold, Ulrike; Wagner, Michael; Timmermann, Gabriele; Pommerening-Roeser, Andreas; Koops, Hans-Peter. Lehrstuhl fuer Mikrobiologie, Technische Universitaet Muenchen, Freising, Germany. International Journal of Systematic and Evolutionary Microbiology (2003), 53(5), 1485-1494. 9. Biogeochemical processes in a small California estuary. 2. Nitrification activity, community structure and role in nitrogen budgets. Caffrey, Jane M.; Harrington, Neil; Solem, Icarus; Ward, Bess B. Center for Environmental Diagnostics and Bioremediation, University of West Florida, Pensacola, FL, USA. Marine Ecology: Progress Series (2003), 248 27-40. 10. Worldwide distribution of Nitrosococcus oceani, a marine ammonia-oxidizing -proteobacterium, detected by PCR and sequencing of 16S rRNA and amoA genes. Ward, Bess B.; O'Mullan, Gregory D. Department of Geosciences, Princeton University, Princeton, NJ, USA. Applied and Environmental Microbiology (2002), 68(8), 4153-4157. 11. Elevated salinity selects for a less diverse ammonia-oxidizing population in aquarium biofilters. Grommen, Roeland; Dauw, Lenny; Verstraete, Willy. Laboratory of Microbial Ecology and Technology (LabMET), Ghent, Belg. FEMS Microbiology Ecology (2005), 52(1), 1-11. 12. Comparative analysis of nitrifying bacteria associated with freshwater and marine aquaria. Hovanec, Timothy A.; DeLong, Edward F. Ecology, Evolution Marine Biol. Dep., Univ. California, Santa Barbara, CA, USA. Applied and Environmental Microbiology (1996), 62(8), 2888-2896. 13. Nitrogen-versus phosphorus-limited growth and sources of nutrients for coral reef macroalgae. Larned, S.T. Marine Biology (1998) 132: 409±421. 14. Ammonia in estuaries and effects on fish. Eddy, F.B. Environmental and Applied Biology, University of Dundee, Dundee, UK. Journal of Fish Biology (2005), 67(6), 1495-1513. 15. Low levels of environmental ammonia increase susceptibility to disease in Chinook salmon smolts. Ackerman, Paige A.; Wicks, Beverly J.; Iwama, George K.; Randall, David J. Faculty of Land and Food Systems, University of British Columbia, Vancouver, BC, Can. Physiological and Biochemical Zoology (2006), 79(4), 695-707. 16. Mechanism of the reaction of ammonia with the bisulfite derivative of formaldehyde. Henaff, Philippe Le. Compt. Rend. (1963), 256 3090-2. 17. Method and Product for removal of chloramines, chlorine, and ammonia from aquaculture water. Kuhns, John F. US Patent #4,666,610; May 19, 1987.